We have a FANTASTIC online option now available for you and parents throughout Australia and the world are RAVING about it’s effectiveness! Our online hypnobirthing course option is the next best thing to attending face-to-face classes. It is flexible, easy to follow and it WORKS! Our hypnobubs™ hypnobirthing online course is extremely comprehensive and includes 10 x video tuition and practice sessions, 5 x long-play hypnobirthing mp3s, an eBook, handouts and worksheets. And best of all, you receive access to the whole course straight away; easily accessible on a secure online learning platform via your computer or mobile device, 24/7. Geelong parents-to-be, you can also upgrade to a PRIVATE 90 MINUTE SESSION with Rosie for just an extra $150. This includes a personalised one-on-one private 90 minute session with me in person in your own home. I will walk you through any areas that require further clarification; help you to address any fears and reservations that may be holding you back from the birth you desire and deserve; and also personalise your practice routine to ensure that you are getting the most out of your tuition. Have peace of mind knowing that you have your preparation covered either way. This package includes the Hypnobubs® Hypnobirthing Hypnobirthing Online Course PLUS the Change of Circumstances (Positive Cesarean) Course for a special discounted price.This online hypnobirthing course option is perfect if you are aiming for a natural birth but also wish to be very well prepared for a cesarean birth (if required). Comprehensive video sessions with Melissa Spilsted including step-by-step tuition and practical exercises (for you and your birth partner) for both the Hypnobubs Online Childbirth Course PLUS the Special Circumstances Course (which you can access if you find out that you need a cesarean). 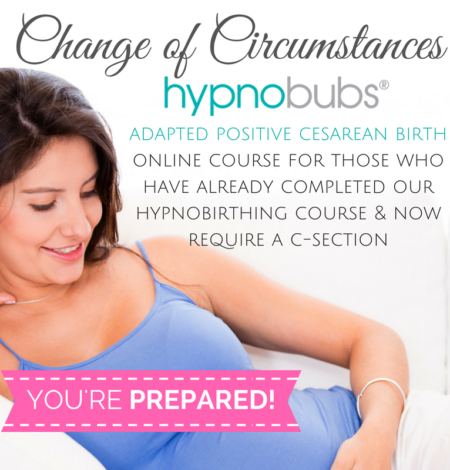 Premium Package: Hypnobubs™Hypnobirthing Online Course, Change of Circumstances Course + 90 MINUTE Private Session. In addition to the full Hypnobubs® Hypnobirthing Online course you receive a 90 minute private video call/Skype session with a Certified Practitioner who will walk you through any areas that require further clarification, help you to address any fears and reservations that may be holding you back from the birth you desire and deserve and also personalise your practice routine to ensure that you are getting the most out of your tuition. PLUS – you get the Change of Circumstances Course, to ensure that you have EVERYTHING you need for your labour and birth. This package has it all and is highly recommended if you want ‘the edge’ in your birth preparation! Comprehensive video sessions with Melissa Spilsted including step-by-step tuition and practical exercises (for you and your birth partner) for both the Hypnobubs Online Childbirth Course PLUS the Change of Circumstances Positive Cesarean Course (which you can access if you find out that you need a cesarean). Confidence+ Package: Hypnobubs™ Positive Cesarean Birth Course + 90 MINUTE Private Session + Bonus albums. Make your birth one that you will want to remember for the rest of your life by preparing yourself well, removing fear and approaching birth in a calm and very positive way. To give you the edge in your preparation, this package includes the Hypnobubs® Positive Cesarean Birth Course, a 90 minute Private Skype session with a Certified Hypnobubs® Caesarean Trained Practitioner, PLUS – you get some bonus albums for after birth, to ensure that you have EVERYTHING you need for your positive birth and beyond. If you have already completed a hypnobirthing course and have had a change of circumstances (now require a c-section for the safe arrival of your baby) – then this course is made especially for you!